Spotting between periods can be a cause for concern for many women. In the majority of cases, there is nothing to worry about if you notice spotting before or after your period. In fact, light vaginal bleeding or spotting in the middle of the menstrual cycle can be normal for some women. For example, ovulation bleeding, implantation spotting, or even stress can cause pink or brown spots on your underwear before or after your period. It’s important never to ignore spotting after your period has ended. Spotting between periods could also be a symptom of something more serious. Spotting before or after your period can be a sign of ovarian cysts, pelvic inflammatory disease, fibroids, or cancer. Also, if you have passed the menopause and you notice any irregular bleeding, then you should visit your doctor for a checkup. Depending on the cause of the irregular bleeding that isn’t connected with your period you may also have other symptoms. Sometimes, spotting that happens between periods is accompanied by abdominal cramping, vaginal discharge that has an abnormal color, lower abdominal pain, and pelvic discomfort. In this article, you will find out about the many reasons for spotting between periods. In some cases, home remedies can help to relieve some of the discomfort. You will also find out when you should see a doctor about abnormal vaginal bleeding. Spotting Between Periods – What Does It Mean? Spotting is light vaginal bleeding that occurs before your period begins or after your period has ended. Spotting doesn’t usually follow a set pattern and can happen at any time when you are not menstruating. Because spotting is usually a symptom of another medical condition, there will often be other symptoms. Sometimes, identifying the other symptoms that occur with spotting can help to know the cause. Let’s look at some of the common reasons why you might notice spotting between periods. Mid cycle spotting could be a sign that you are ovulating. Ovulation occurs about 10 to 14 days after the start of the menstrual cycle and can cause light bleeding (ovulation bleeding) about 2 weeks before your next period. Birth control can sometimes cause spotting between periods as your body adjusts to the hormones. Both oral contraception and intrauterine devices (IUD) can cause irregular bleeding before or after your period. Heavy vaginal bleeding is not normal when using hormonal contraception. If you notice irregular bleeding between periods that is more than spotting, and you have cramping or vaginal discharge with a fishy smell, you should speak to your doctor. Stress can affect your hormone levels and cause intermenstrual bleeding as well as a thin, light watery period. There are many ways to reduce stress naturally and help you regain a regular menstrual cycle. For example, there are many essential oils that help to reduce anxiety and stress. These natural methods for stress relief may help to stop spotting between periods. You might experience light brown-colored or pink spotting just before you expect your period if implantation has occurred and you are pregnant. Implantation spotting will only last a few days and because you are pregnant you won’t have your period. Of course, the only way to be sure if you are pregnant is to take a pregnancy test at home or at your doctor’s clinic. If you are approaching the menopause, you may notice that you have spotting between periods or you bleed more during your regular period. As your hormone levels fluctuate in the perimenopause stage you will also experience irregular periods. To get relief from the symptoms of menopause, you can try some natural supplements for the menopause. Many women find relief from menopausal symptoms by using essential oils. Because irregular menstrual bleeding is connected with your hormone levels, an underactive thyroid (hypothyroidism) can also cause pink spotting between your periods. If you have an underactive thyroid, please check out my article on how to treat hypothyroidism naturally. Some pink or brown spotting between your periods could be an indicator of ovarian cysts. Cysts on the ovaries are considered a normal part of the menstrual cycle. In the majority of cases, the cysts don’t cause any symptoms, however, they may cause pelvic pain. To find out more information about ovarian cysts, please read my article on the warning signs of ovarian cysts. In many cases, doctors take a “wait and see” approach to see if the cysts go away on their own or need to be treated. One reason for light spotting to heavy bleeding between periods is a condition called polycystic ovary syndrome (PCOS). This is where there are multiple cysts on the ovaries and it interferes with your hormone levels and ovulation. Some of the ways of treating the symptoms of polycystic ovary syndrome include taking Chinese licorice, cinnamon, black cohosh, or red raspberry leaf tea. Abnormal bleeding or spotting after your period can be a symptom of pelvic inflammatory disease. PID is a bacterial infection affecting the reproductive organs that can cause a lot of abdominal discomfort. It’s important to get prompt medical treatment if you suspect you have contracted a bacterial infection. If left untreated, PID can lead to reproductive complications, including infertility. Pelvic congestion syndrome is a painful condition that often results in light to heavy spotting between periods. Pelvic congestion syndrome is like having varicose veins in your pelvic area. If you notice spotting a week or 2 weeks after your period and have heavy menstrual bleeding, it could be a sign of uterine fibroids. Uterine polyps most commonly develop in women who are going through or have completed menopause, although younger women can get them too. They are usually noncancerous (benign) but they are known to cause issues with the menstrual periods or even infertility. You can strengthen your pelvic muscles and help prevent urethral prolapse by performing Kegel exercises. Doctors say that vaginal bleeding associated with uterine cancer can start as light bleeding with watery discharge. In time, the bleeding will become heavier. If you have been through the menopause, it’s important to see your doctor about any kind of vaginal bleeding. Thankfully, occasional spotting between periods is usually nothing to worry about and it’s just part of the menstrual cycle. However, abnormal spotting or bleeding when you aren’t menstruating can be a sign of something more serious. MayoClinic. 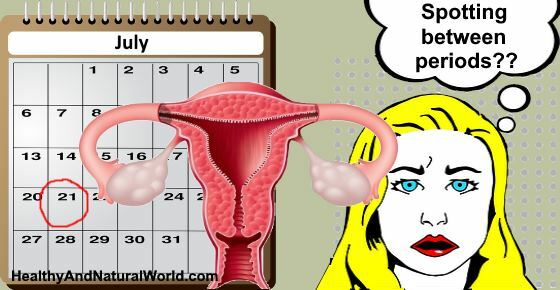 Menstrual cycle: What’s normal and what’s not. PatientInfo. Intermenstrual and postcoital bleeding. MedicineNet. Spotting vs. period: How to tell the difference. NIH. What are the symptoms of menstruation? MayoClinic. Is implantation bleeding normal in early pregnancy? ColoradoWomensHealthOrg. Abnormal vaginal bleeding & birth control. NHS. What causes bleeding between periods? ACOG. Perimenopausal bleeding and bleeding after menopause. WebMD. Why am I spotting between periods? I’ve had spotting before and after my period, yet I’m still bleeding. I’ve been bleeding for a very long time now getting to a month. Is it normal?? And i don’t exlerience any paim, fatigue l, back ache etc. Please what do I do? Hi Nana, bleeding that lasts for so long can be normal in some situations, for example if you’ve recently had an IUD fitted, but I’m not familiar with your medical history and cannot give medical advice. The safest thing to do would be to see your doctor to find out the reason for that and to get a professional diagnosis.